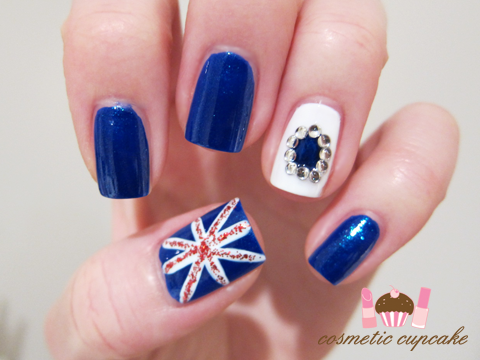 Cosmetic Cupcake: Royal wedding nails! Unless you've been living under a rock I'm sure you know that the royal wedding is on today! I don't care too much about the royals (OK maybe I secretly do have a fascination with them) but I am such a hopeless romantic and I absolutely adore a good royal wedding. Weddings are such beautiful events and especially with all the pomp and ceremony it's such a show! Of course I had to do a mani to celebrate the wedding of the year! I started off with 1 coat of "underwear polish" in Icing Rebellious to prevent staining. I then applied 2 coats of Orly Royal Navy to all fingers except my ring finger. For my ring finger I wanted to replicate the gorgeous engagement ring. I used 3 coats of Ulta 3 lily white as a base and used Born Pretty dotting tool to dot an oval using China Glaze Up All Night for the sapphire. I then applied silver rhinestones to replicate the diamonds. 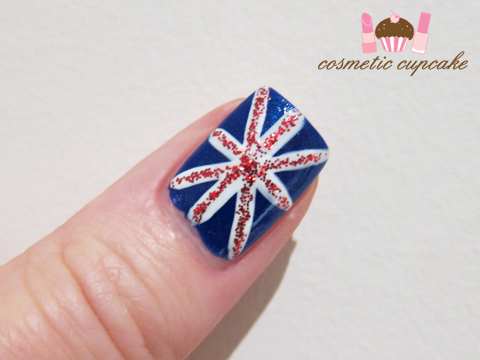 For the Union Jack I used Kiss nail art paint striper in white to freehand the white lines and CM nail art striper in red glitter over the white. Obviously royal weddings aren't for everyone but who doesn't love a fairytale love story?!! Off to watch the ceremony now!! Will you be watching? Oh my GOD I LOVE IT!!!! I am seriously considering doing this for work tomorrow. Thats gorgeous! Ive gone with purple as historically its a royal colour...never thought of doing a british theme. Fantastic idea. That is the PERFECT mani to celebrate the wedding! The base colour is beyond gorgeous and I love the ring finger. I've watched part of the ceremony. Lots of praying and singing, but Kate's dress was beautiful and classy. Just waiting for the balcony kiss now! It's like a fairytale. it's awesomeeeee!!! you are so creative! even the ring? wow! 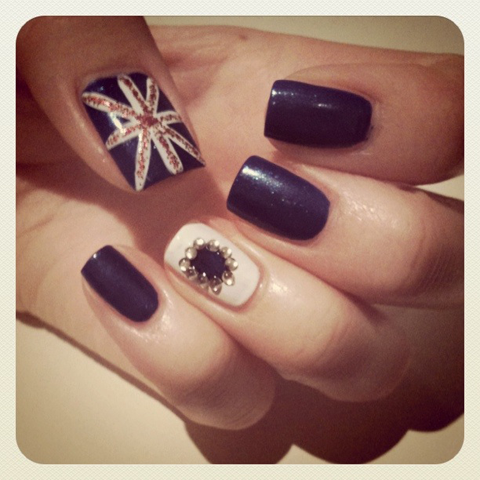 your thumb is the perfect shape for flags! hahaha. and the ring was a nice touch! Haha, I did not know the wedding was today, I just assumed it would be on a weekend. Ooops! I love mani, though! I love this mani, and I love Instagram!!! This is so lovely! 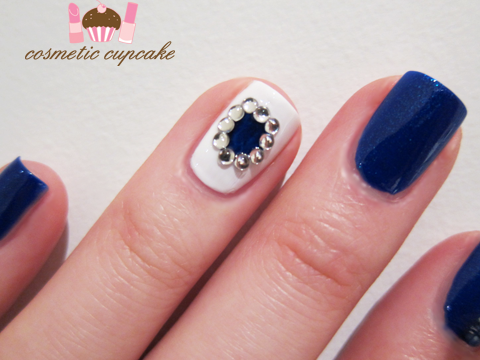 Very simple but with a twist :) Love the ring finger!! I love the blue color combination nail paint here rather then violet. And the white one is extra ordinary. @Danielle: Thanks Danielle! I thought Royal Navy was an appropriate polish to use given the name. It's such a pretty blue too! It was definitely a fairytale wedding. So so beautiful! @Reous: You are so sweet =) Thank you! @Edwina: Orly Royal Navy is such a gorgeous blue with glitter flecks. The name is so appropriate too! @Ronnie: Awwww thank you so much hun! Times like this I wish I was in Britain to enjoy the festivities hehe. @BeautyMark3d: Oh you are too kind! It's a very simple design to do. You should try it! @Amy: I needed some bling to my mani so couldn't resist doing the engagement ring. It was my favourite finger to do so I'm so happy to hear you like it! @Varnish Vixen: You would think so wouldn't you?!! I guess royals just do it differently haha. Thanks hun glad you like it! @Dramaqueen93: Thank you so much! @GothamPolish: Instagram is so fun! I can't believe it I didn't try it earlier. @Jennifer: Awwww thanks Jen! I couldn't resist doing the ring, it's so gorgeous! I'd love something like it myself hehe. @deerest: The royals aren't for everyone! I just love weddings especially royal ones, they are so glamourous and it makes a girl dream of being a princess! WHAT THE HECK!! THAT IS INSANELY GORGEOUS! It's totally perfect. omg love that you even have the ring on your ring finger!! Beautiful!!!! This looks awesome! I love them! !